Now that Chocolate Log Blog has morphed into Tin and Thyme, I don’t do as much chocolate blogging as I used to, but it’s still very much a passion and I create at least one new chocolate recipe a month. I’m also still running the monthly chocolate blogging challenge, We Should Cocoa. Astonishingly, this has been going for over six years now. Where does the time go? To mark this blogiversay and my enduring love of chocolate, Hotel Chocolat sent me The Valentine’s. This box of heart shaped delights is from their Sleekster range and contains 27 delectable chocolates. Flavours include a fiery hazelnut praline with habanero chilli, salted espresso, honey, prosecco and gin and passion fruit cream. I love them all, but I was most surprised by the buttered rum, which I think might be my new favourite chocolate. Anyway, this anniversary is a celebration of my readers too. This blog and the recipes I create would not exist if it wasn’t for you. Thank you so much for reading my posts, trying out my recipes and commenting. A special thank you goes to those who have stuck with me through the years – you deserve a medal! So to the giveaway. The Valentine Sleekster is obviously no longer appropriate after today. Be not disappointed. For my Valentine’s Day Giveaway, I have a splendid Mother’s Day Sleekster to offer instead. A whopping 350g of dark, milk and white chocolates are filled with pralines, caramel, fruity truffles and tipsy ones too. 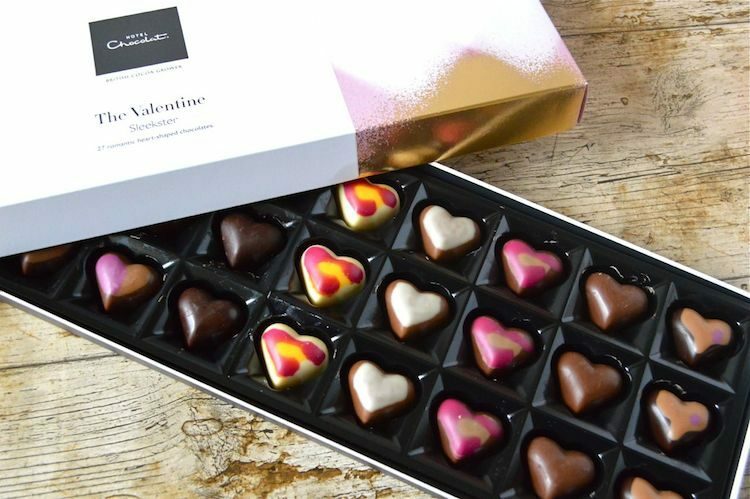 If you want to get organised for Mother’s Day, which falls on the 26th March this year, this box is available at Hotel Chocolat retail outlets or online for £22.50. Hotel Chocolate is kindly offering one Tin and Thyme reader a Hotel Chocolat Mother’s Day Sleekster box worth £22.50. To be in with a chance of winning, please fill in the Gleam widget below. You will need to leave a comment on this post, answering the question, which then gives you additional chances to enter if you so wish. Gleam will pick a winner at random from the entries received who will then be contacted via e-mail. If you are commenting anonymously, please give me some way of identifying you as I will be verifying the validity of entries. Any automated entries will be disqualified. This giveaway is only open to those with a UK postal address. Winners will need to respond within 3 days of being contacted. Failure to do this may result in another winner being picked. There are no cash alternatives. The Mother’s Day Sleekster is offered and provided by Hotel Chocolat and Tin and Thyme accepts no responsibility for the acts or defaults of said third party. Tin and Thyme reserves the right to cancel or amend the giveaway and these terms and conditions without notice. I was sent the Hotel Chocolat Valentine Sleekster as a thank you. I was not required to write a positive review and all opinions are, as always, my own. It is a day to spend time with your loved ones, whether it is a partner, your family or a pet. And if you are completely on your own, you can treat yourself to something you love or enjoy! To appreciate your better half. Its a day to spoil and be spoilt. Just have fun together. another expense!! but a good reason to get spoilt!! Valentine’s Day is a celebration of lust and lust means choccies. It means a time to enjoy all the pretty things that people put out. I don’t really go for Valentine’s Day in the typical sense because I don’t think a special day is needed to show someone you love them. Heart and flower shaped goodies are never a bad thing though! It’s a day where I remind myself how lucky I am to have my partner & gorgeous boys around me. Happy Blogiversary Choclette. Blogging world has changed so much and there are only a few blogs I follow loyally, though I may not always comment and yours is one of them. I am genuinely so happy for you and truly wish you many many good years of blogging and happiness with your CT.
Aw, thank you so much Shaheen. Blogging has truly changed, so I do really appreciate comments and interaction from my vintage blogging friends. I don’t see it as a particularly special day, it’s crazy to express how you feel about someone on one day of the year. It should be all year round! Valentine’s Day used to be a day when people could let others know that they had romantic intentions, although as Valentine’s cards were anonymous and not signed with real names, I’m not sure how that worked! It would be nice to go back to a gentler sort of celebration, and take the emphasis off spending money! Yes, so true Suelle. It’s rather sad that it’s become associated with so much commercial hype. Oh how lovely. Happy Birthday to your daughter. It’s just a nice way to think about my family and be thankful for them. It is not a particularly special day for me. I think it’s quite commercial and an excuse to get people to spend money. I much prefer romantic gestures like cooking a meal for my partner or going for a long walk with him. Have to admit that i’m not a fan of it, I think the idea behind it is lovely but it has now become so over commercialised and present focused that it’s lost its meaning for me. Congratulations on the anniversaries, funny how some dates are are occurring theme in our lives. Love the idea of creating a new recipe every month, where does the inspiration come from? Thanks Linda. Feb 14th is definitely an interesting day for me, but not in the obvious sense. Inspiration for creating recipes probably comes from thinking about food far too much. For me it’s all about letting the person you love know how much they mean to you. It’s not all about the gifts. Thanks Eb. Indeed, things are vastly different now, but I’m hoping I can hang on in there for a few more years yet. Valentine’s day is a nice excuse for a bit of fun, even if it with not spending any money. We find our own way, our favourite meal, a “no tech” night and family time. Oh nooooooooo! Perhaps you could have an official birthday and then you can choose your own date. Hahaha, indeed that would be wonderful Johanna, especially as I now have family living in Melbourne. Valentines day isn’t very different to any other day to me,my husband and I tell each other we love them about 20 times a day anyway.I did get nice flowers and a card though. I think it’s a day where companies make a lot of money. Romance shouldn’t be about just one day, it should be everyday. Fir me, Valentines day is just a bit of din. I don’t take it seriously, we don’t exchange lavish gifts and are quite happy just using it as an excuse for more chocolate. Valentine’s Days to me means chocolate! We don’t bother with cards as it just seems an excuse for the card shops to make money, but I do like having a box of yummy valentines day chocolates. It’s time for me and my husband to spend together, just us. Just to have time alone with my partner which we every rarely do. An excuse for a meal out !! Just showing my wife how much I still love her. We don’t go mad, but we do something together and make time for it. A day to remind us how we should all be more loving, to everyone everyday and chocolate should always be quality! Celebrating the very day we met, 42 years ago! Valentine’s Day means nothing to me – it’s just a day, like any other day. Valentines day mean to me a special day to celebrate love & have a few chocs! It means little to us now. We did celebrate it when first courting, then we were married, kids came along, work became busy, kids now left and married and we have retired and sort of celebrate it continually by loving companionship. We enjoy and excuse to make a special meal whether it’s chineses new year, national sweet potato day or valentines. However, I am partial to the odd very nice chocolate treat, bunch of daisies or great tasting tipple but that is an expected ‘surprise’ year-round. A day to spend with my husband – we’ve been married over 30 years. Hotel Chocolat is so yummy, I’d love to win it for my mummy! absolutely nothing. i’ve been single for a very very long time! Valentine’s Day for me is a bit of fun. A chance to show your loved one you care about them, and to do something nice. Me and my husband always treat it as a fun day, a chance for a silly present and to appreciate what we have. Another day to waste money – be single and buy yourself cake instead! Not a lot as we gave up getting gifts and just take a posh holiday each year. Showing the person I love that I love them. It is a good excuse for a date night with your partner. We don’t usually celebrate Valentines Day but this year we actually crossed the border from Cornwall into Devon and went for a nice meal at an Italian restaurant. It shouldn’t really be any different to any other day but it makes you stop and consider each other. The same goes for Mother’s day. Take time out to appreciate each other and reminisce about the old times together and when you met, or got engaged or married. A double celebration. I hope you had a lovely day. Valentine’s Day is for Celebrating Romantic Love. A Delicios meal and night at the theatre can be a wonderful way to Celebrate Valentines with a loved one. I’m not really a fan, especially not of all the commercial pressure. It’s just a day. Though chocolate is always welcome. To me, Valentines Day means spending time with your loved ones. I don’t think you should need a special day to tell someone you love them. Love the chocolates & flowers but to be honest every day is Valentines Day with my Hubby. He is very romantic & I know I am lucky. An excuse to spend even more time with my husband! Chocolates and a lovely meal! I love Valentine’s Day. It’s one of the very rare occasions my husband & I have a night out without the children! It’s a day to spoil one another but I think it’s good to make the effort all year round. Had a taste of these in their store the other day, if I don’t win will definitely be buying my mother a box!! If you’re a bloke it means you have to pay through the nose, or your really pay the price. It’s a day to spend time with loved ones. and show them that you appreciate them. It is a day to stop and think about how much you appreciate your loved ones and show them you care. We don’t celebrate Valentine’s day, it just seems a shame that it takes a ‘day’ to tell someone special how special they are to you! Not a great deal really. I have never bothered much with Valentines day. I do like the discount valentines chocolate in the shops after though! Just another day. You should spoil and show your love everyday, not just because convention says you should. Still I will always get my partner a small card and maybe a little treat or a night away in a local English pub. Cared for, loved, respected and happy. I love valentines day as it makes you feel as one. Valentine’s day to me is a very good meal with a very good bottle. And just the two of us. Answering honestly, nothing but a chance for commercialism to shine its light, we are romantic throughout the year and make time genuinely, not when society tell us too ! It doesn’t mean a huge amount to me as my partner is nice to me all year round and loving although its the one time of year where I might get a bunch of flowers. It’s just another day for us, we don’t sent cards to each other but we do try and sit down together after the children go to bed. Being spoilt, maybe with flowers and chocolates too! Time for a cuddle-up on the sofa. Is a day to cherish and spoil, loved ones! Valentines Day for me is a day to spend quality time with your loved ones, make an effort, spend the evening together away from tablets and phones! Its the day one of the year we get to enjoy a romantic candlelit dinner together and the only time my hubby sends me flowers! Unfortunately it means nothing to my husband so we don’t celebrate it, but we see eye to eye on most things so I tend to let him off the hook! It’s something special between me and my partner that doesn’t involve the kids! It doesn’t mean much as we don’t celebrate it. It’s a nice chance to spend some time with loved ones. We don’t have to spend money on presents. Time is more precious. Being honest, very little. Comes soon after Xmas, my B’day and our Anniversary. Everything is expensive so would rather leave for another time and really treat my wife to a special day. We do discuss though so I know we are on the same page. I treat Valentine’s Day in a similar way to how I treat Mother’s Day…it’s an unashamed opportunity to tell your nearest and dearest how much they really mean to you. We don’t say it enough in day to day life do we? It might be seen as a bit commercial, but it is a nice day to make some time for your loved ones. A day to celebrate our relationship. Absolutely nothing-it’s just a normal day where flowers and chocolate prices increase! Its just another day in the calendar. I don’t need to be told a particular day to tell or show my partner I love them. Valentine’s day is a day to spend with your loved ones, doing things you love. Not buying over priced flowers or going out to eat! haha. Well, to me, it’s just a way for companies to make you buy stuff you don’t need!! I’m afraid to say I’m not a big fan of Valentine’s day. I would prefer to give or get given a pressie out of the blue rather than on a set date. I hate it! overhyped and just another excuse for the shops to get money out of you! It means I should change the bed sheets. Only joking! Valentines Day is about spoiling your loved one even if its just to show how much you love them still. Chocolate, lots of chocolate, and a reminder that my partner is the best. Then a little bit more chocolate. To be honest with you not a great deal. Its just another day and a waste of money, i hate wasting cash so if my partner came home with flowers id be very cross as we live with a strict budget and its hard enough as it is without spending cash we dont have. an excuse to go out for a meal! making more of an effort to express my love + passion! Means spending time and enjoying and appreciating the person you love! i dont celebrate valentines day at all probably cause i never get a gift. id be lucky if hubby remembers our wedding anniversay! Valentine’s Day is a day to celebrate love. There is not enough love in the world. I think it’s more about the love of all mankind and being good to each other promoting each other in a way that is positive and beneficial to all. Everyday should be Valentine’s Day! Definitely Emma. If we all did that, the world would be a truly wonderful place. It doesn’t mean much to us, we buy each other chocolates but don’t take it too seriously! I must admit we don’t usually bother and prefer to save our money to put towards other things but I do like the idea of having a romantic day with my hubby. Like to have a nice meal for the family and a yummy desert but apart from that my hubby and I don’t do presents. We don’t really celebrate Valentine’s Day, we have special days throughout the year though. Just a day to love and be loved, hopefully like every day! The chance to eat lots of food, have some wine and enjoy the company of my fave boy! It’s largely commercialised – we prefer to do spontaneous thing through the year instead! It means the chance to do something special for my husband. Valentine’s Day means a lot to me because I have celebrated 52 of these with my husband and everyone has been very special to us. Valentines Day used to mean more to me when I was younger but it was very special this year as it was the first Valentines I’ve had since getting engaged! It’s a day to treasure your loved one, and to reflect on the love that is between you. It’s nice to have and give a pressie too as a token of the love between you. I always like to craft a pressie for my husband on Valentine’s day- I think it means more than one that is bought. Valentine’s day is just another day for me, I try to remember buying a card for my husband but that’s about it. I avoid the commercial side but make sure I make my wife feel special like every other day. We don’t buy in to the fuss of Valentine’s day by spending extortionate amounts on each other but we do take the time so appreciate each other so it’s a good reminder not to take each other for granted. I love Valentines Day its the only time I get a present and some flowers. Not very much to me because I am a single pringle but me and the kids usually have a movie night and pizza on Valentines day. Rather bah Humbug, but it’s overhyped and has lost sight of the romantic roots. Valentines day is a bunch of commercial nonsense and not that important to me. For me, valentines day will now forever be the anniversary of my first labour…my son’s birthday is 15th February! Both good memories and bad for you by the sound of it! A little reminder to tell who you love how much you love them. (And mainly: An excuse to eat good food, drink nice wine and overindulge with your special someone!). Not a lot , we try to make time together every month, even a night in the campervan in a field nearby..
It’s over commercialised but chocolates and extra attention are nice. A day where you show your partner your continued love. i’m afraid it’s a bit too commerical these days! Too commercialised and about spending money. Pretty depressing all round really. To me it means another gimmick to make money…me and my fella have been together 14 years and celebrate our love every day. It means that the shops make loads of money! Other than that not much, I tell him I love him every day! for me its just like any other day and I think its too commercialised these days. It gives us an excuse to have a special dinner & a bottle of wine! I love Valentines Day for showing your Love in a well meaning way and not just with gifts, although chocolates are much appreciated and even if your single if you love someone show them by a gesture of cooking a meal or cup of tea on this special day. Valentines is special to me as it was when my Husband proposed to me, we’ve been married for 27 years now! Valentines day used to drive me mad, but now I’ve got a long term boyfriend I quite enjoy it. We try to do something quite low key as the restaurants and shops always charge a fortune! A special day to remember just what love is and hopefully be spoilt too! Appreciating being loved. Spending time with family and indulging in something that you enjoy. A day for cards and roses and a special meal – and having my clean socks all paired up for me! Ok, maybe a little unusual, but it makes me feel cherished. A dinner for my and my other half. For me Valentine’s Day is an opportunity to spend quality time with my husband. It’s a day for romantic love. I don’t get the whole sending a valentine’s card to your son, daughter, auntie, uncle, grandma, cat, dog etc. Valentines to me is a chance to spoil and show how much you love the person you are with, if you are lucky enough to be with someone.